Jeff (Jean Francois if you want to be formal) Coutelou is passionate about nature, about plants and trees as well as vines. He sees his job very much as making the best from nature whilst doing as much as possible to protect and enhance it. 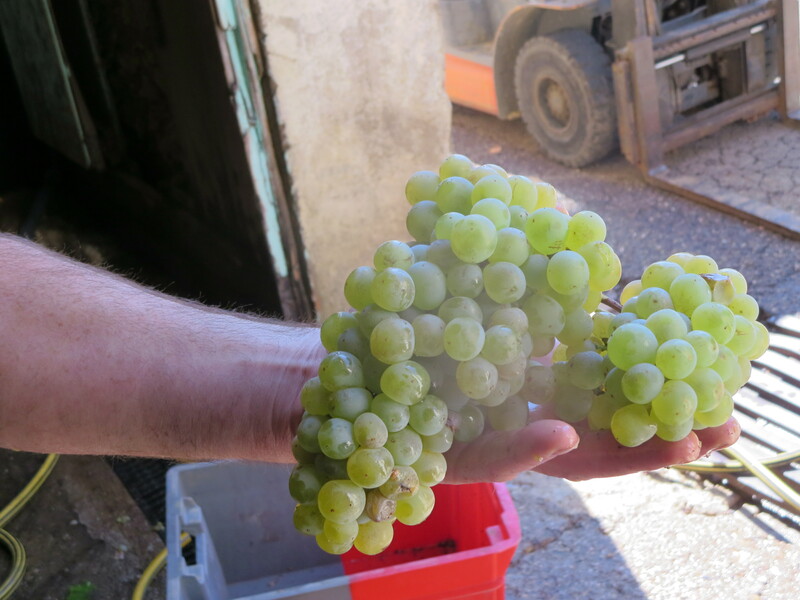 Mas Coutelou has been organic since 1987, long before it became fashionable. 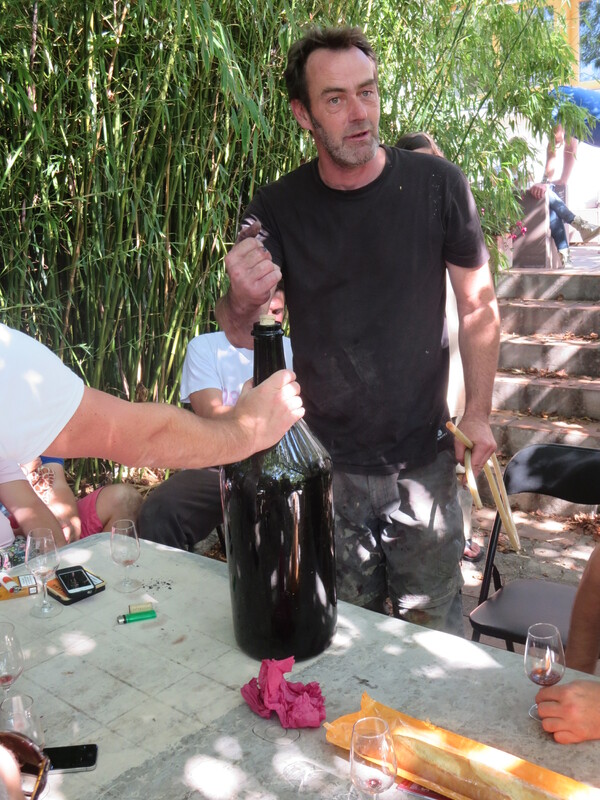 Jeff has now gone further and has been making natural wines for a number of years, the first small tests in 2003. 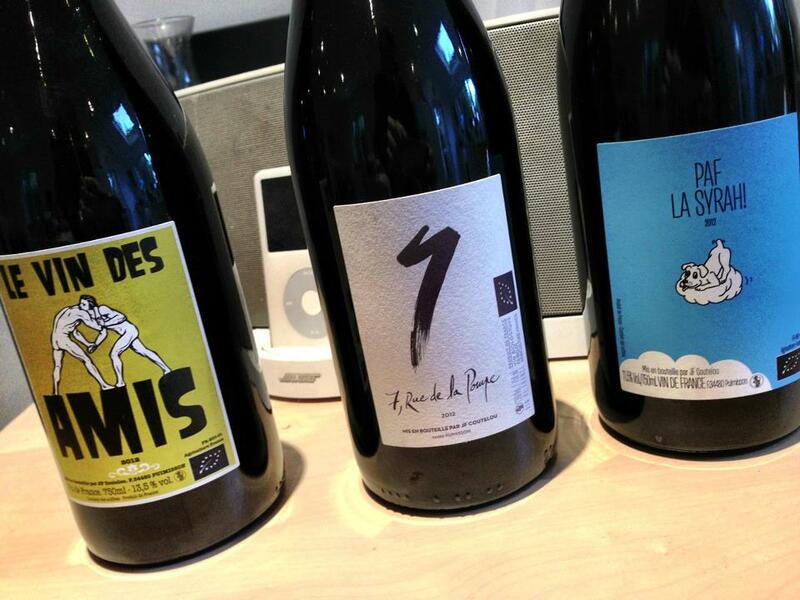 Natural wines are wines which have minimal chemical or mechanical intervention. To prevent or combat diseases only natural products are allowed to be used. 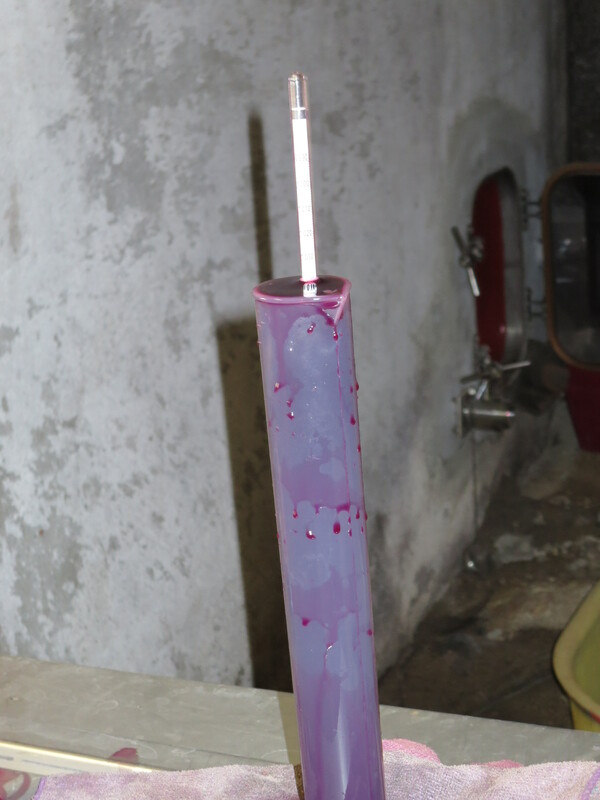 Equally, in the cellar minimal intervention is required for example in using, for example, only natural yeasts. 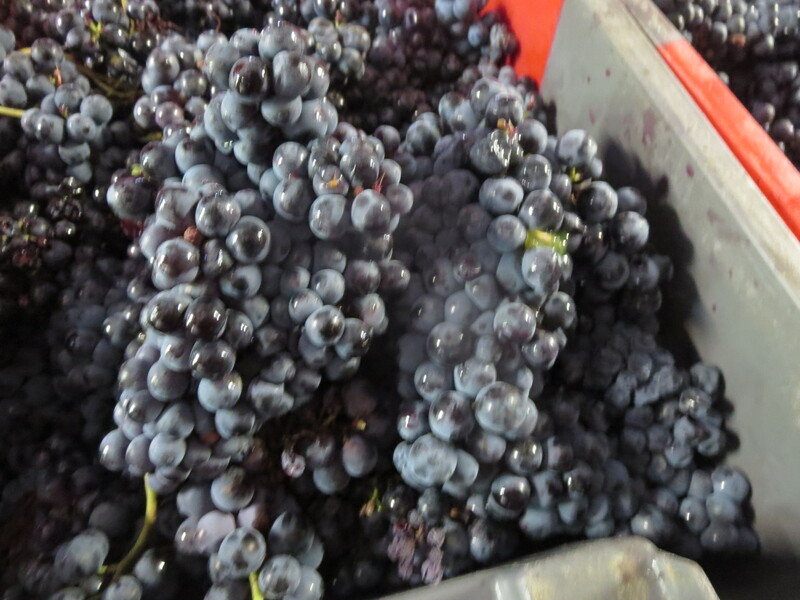 The wine which results is the natural result and product of the grapes. 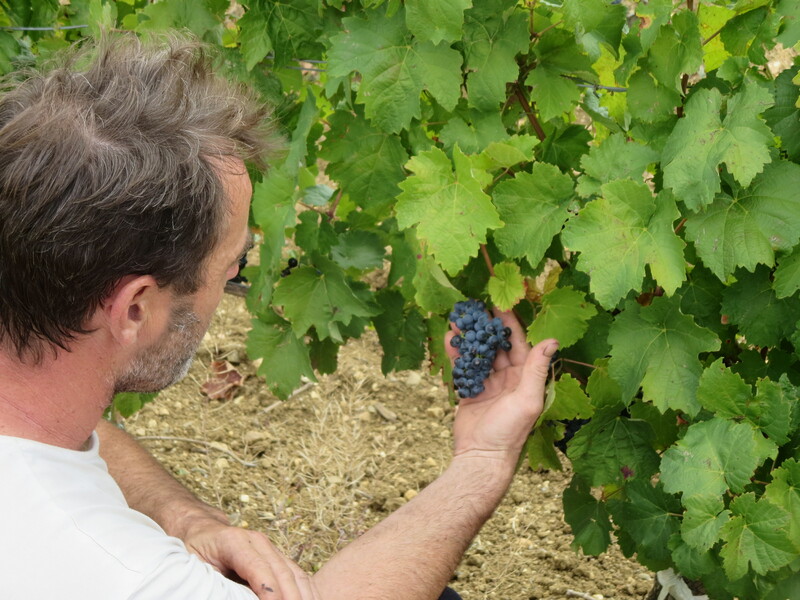 There are bad natural wines for sure but winemakers such as Jeff pour huge efforts into their vineyards to make sure that the grapes are as healthy as nature allows and, in cellar, hygiene and close supervision ensure that quality prevails and top quality wine is produced. Moreover, in recent years he has gone further and has used no added sulphur. 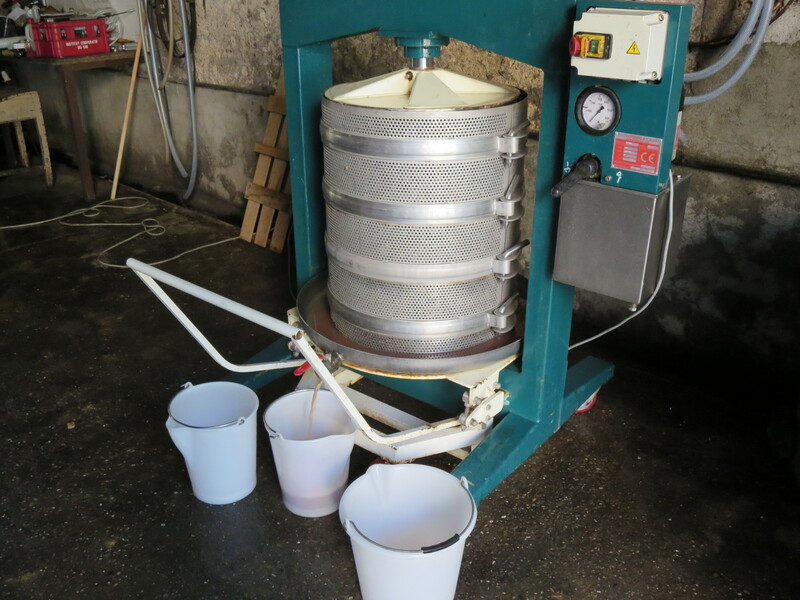 This is usually used by vignerons to fight the risk of oxidation and help preserve the wine. Many people don’t like sulphur in wines, some are sensitive to its effects. It is a risk not to add it but Jeff has been able to avoid it for the last few years. 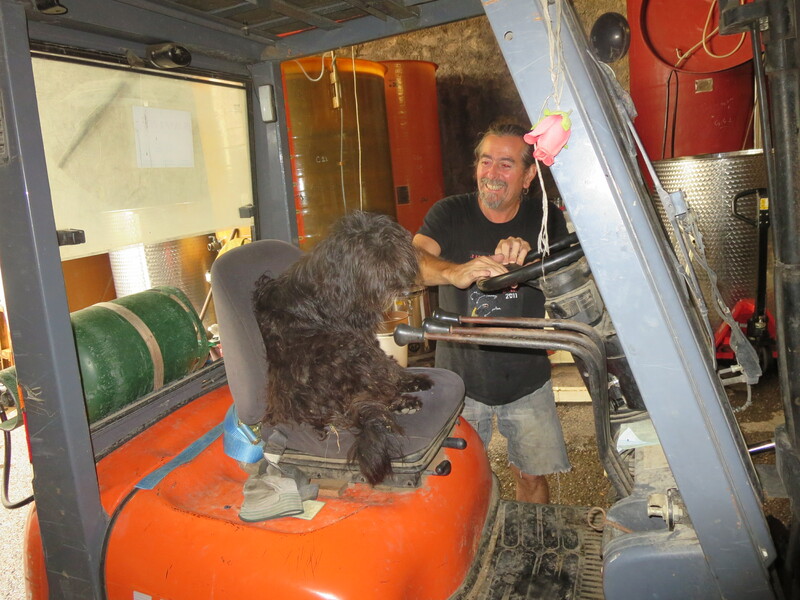 My first visit to Mas Coutelou many years ago included a tour of the vineyards in Jeff’s van with my wife sat on a concrete block in the back and Héro, Jeff’s previous dog, keeping her company. As we travelled around and stopped to look at vines and grapes what shone out was Jeff’s passion for the land, the vines and the olive and fig trees which he has planted to ensure polyculture and a varied landscape. At one point he stopped the van and pointed to two sets of vines. To the left was a neighbour’s vines, They looked beautiful; vivid brown soil with bright green vines in straight rows, all cut to the same shape and size, all neat and tidy. So beautiful that a film company was actually filming with them as a background. But Jeff asked us to look closer. There was no life in the vines or the soil, it was devoid of insects, butterflies, herbs, nothing. Next to these vines were Jeff’s. They looked, to my untrained eyes, much more messy – the vines weren’t regular, there was grass and herbs and flowers between the rows. But they were absolutely teeming with life, insects, butterflies and, as if on cue, partridges running through them. 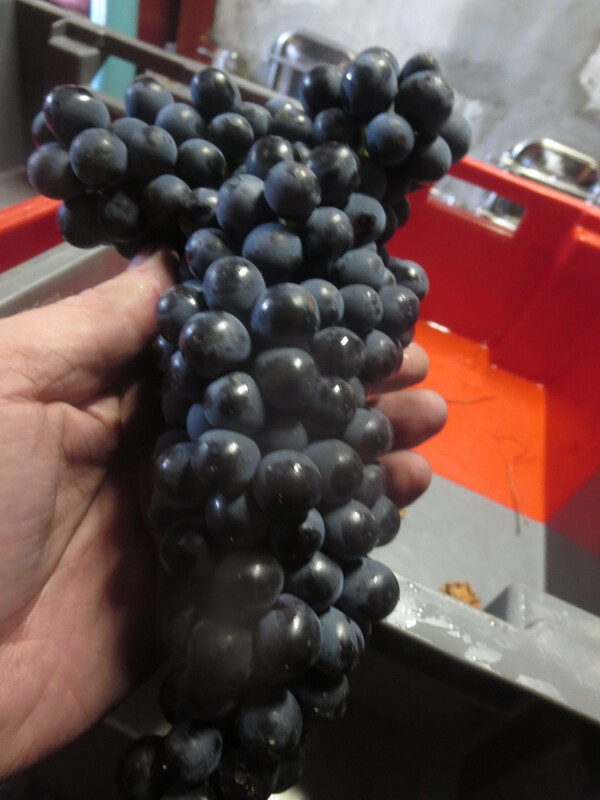 And it’s that life which emerges in the wines. As soon as I tasted them I was blown away by their vivacity. powerful fruit and flavour. These are not just in your face wines though. They have complexity and age very well. I have tasted some from 2001 which are still drinking well and show no sign of being tired. Jeff opened a Flambadou (100% Carignan) from 2007 at lunch last week which was still bright, lively but deep and with layers of flavour. I find it hard to not drink these wines young because they are so delicious young. Vin Des Amis I have usually drunk in the first few months after purchase. Yet a 2010 magnum tasted on Saturday was still full of that freshness but also with more complex flavours. A lesson for me that I must put some bottles away. 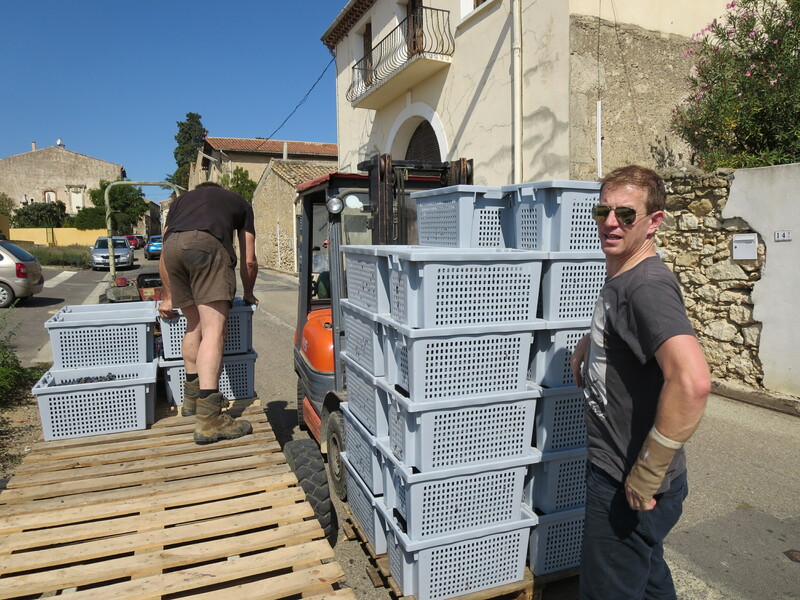 As part of his determination to look after his land and plants (of all kinds) Jeff is interested in preserving wine varieties. 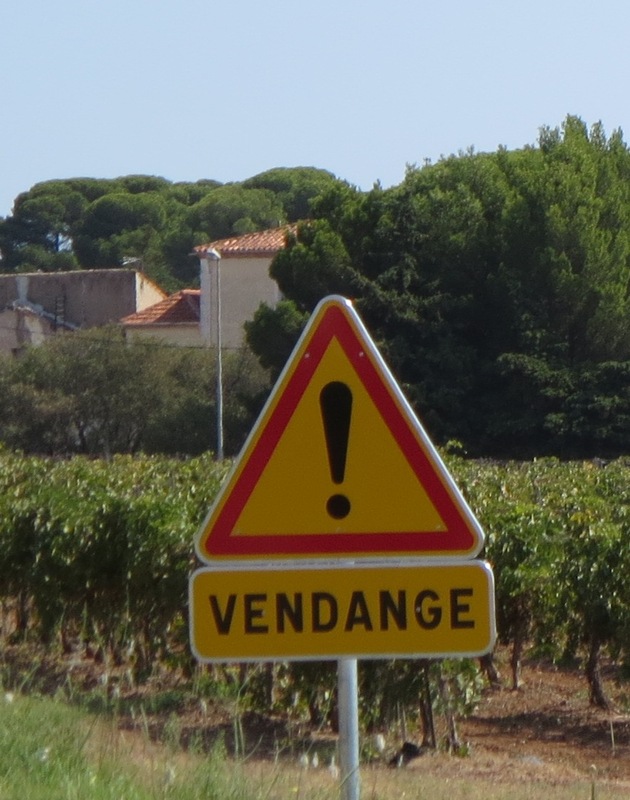 He is one of only two vignerons in the world to have a variety called Castets (Break your head, or skull crusher as I have liberally translated. In fact it is named after the man who developed and spread the variety). 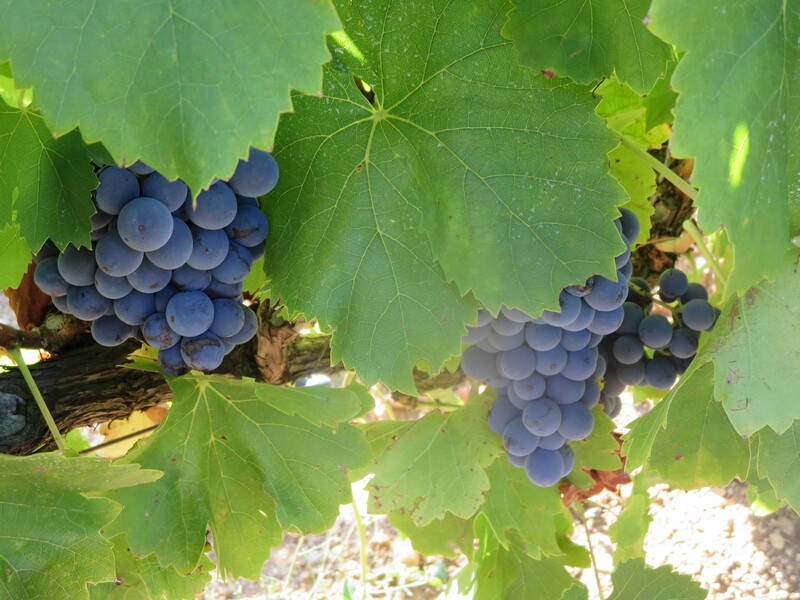 (The other is Chateau Simone in Palette neat Aix-en-Provence). 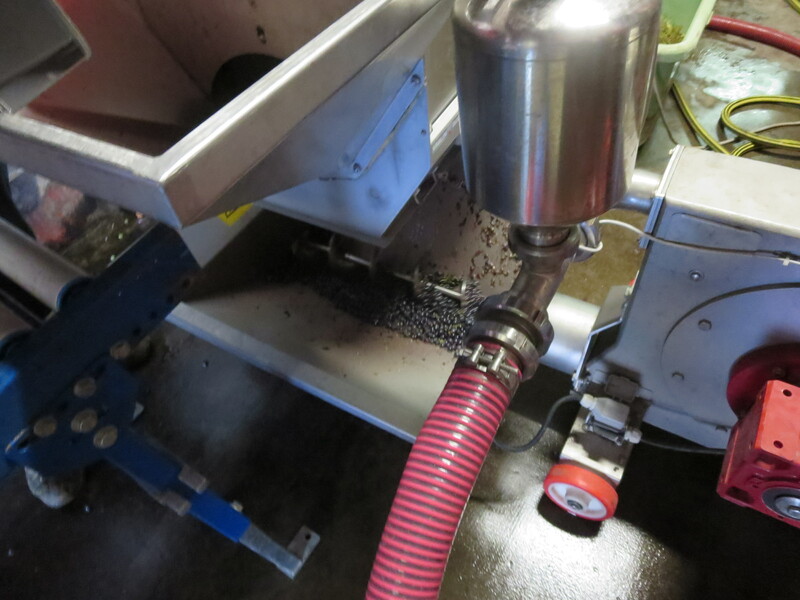 There are only a few rows of the grapes and not enough to vinify separately so they are being blended with Carignan. Can’t wait to taste the results. My wife, Pat, clearly liked the Castets!! Categories: Vignerons, Vines, Wines | Tags: Carignan, Casse Tetes, Flambadou, Mas Coutelou, natural wine, pigeage, sulphur, Vin Des Amis | Permalink. Gaylord Burguiere posts some wonderful photographs on Facebook. He works in the St Chinian area of the Languedoc and his photographs have long been a highlight of the internet for me. This one is called, “Le soleil est de retour pour plus de sérénité pendant les vendanges.” (The sunshine has returned to bring more calm during the harvest) a reflection of the recent storms I described in my last post. To find more of his photographs go to Gaylord’s timeline on Facebook. 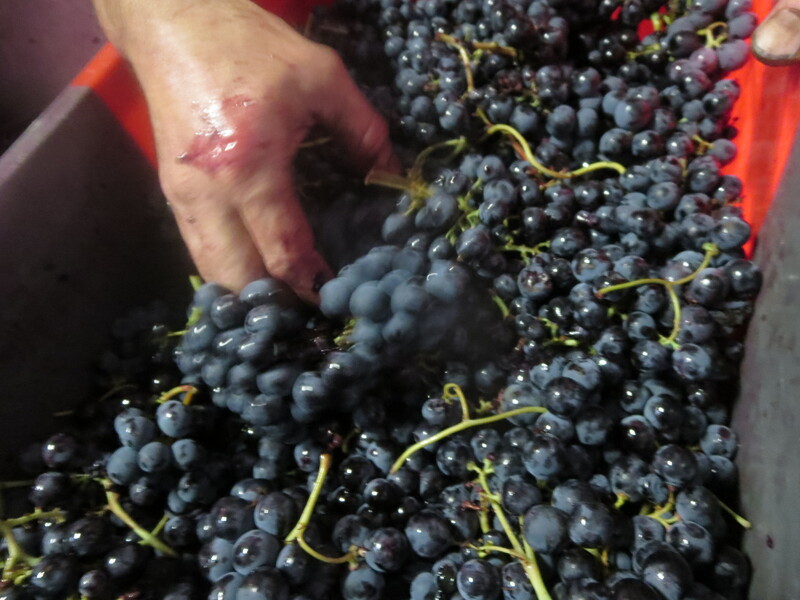 Jeff provides some Cabernet Sauvignon grapes. The review by Jamie Goode quoted below explains their provenance. 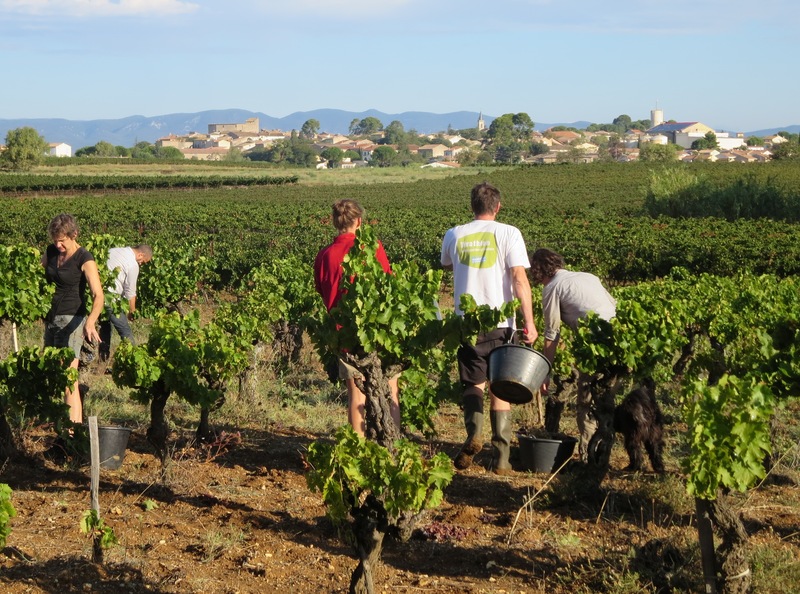 The first London Cru vintage coincides with one of the Languedoc Roussillon’s very best so the quality of grapes which went to London was very high. 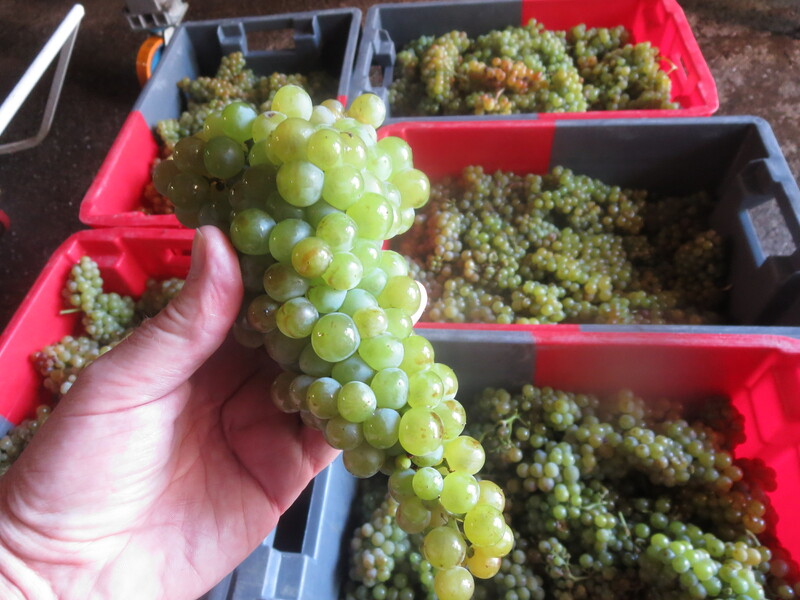 This year’s are of equally good quality though in smaller quantity due to the long drought in the area in 2014. Jamie’s review of the London Crus are available here but this is the review of the Cabernet Sauvignon. Jamie’s is one of the internet’s most respected wine blogs and winner of the best overall wine blog at The Wine Blog Awards. Louis Pasteur is one of my historical heroes. As well as showing the links between germs and disease (by investigating alcohol) he discovered how vaccines work (partly by working to prevent the vine disease phylloxera). The quote above is also very topical after working in Jeff’s cellar. Let me explain. The year has been a trying one for Jeff. 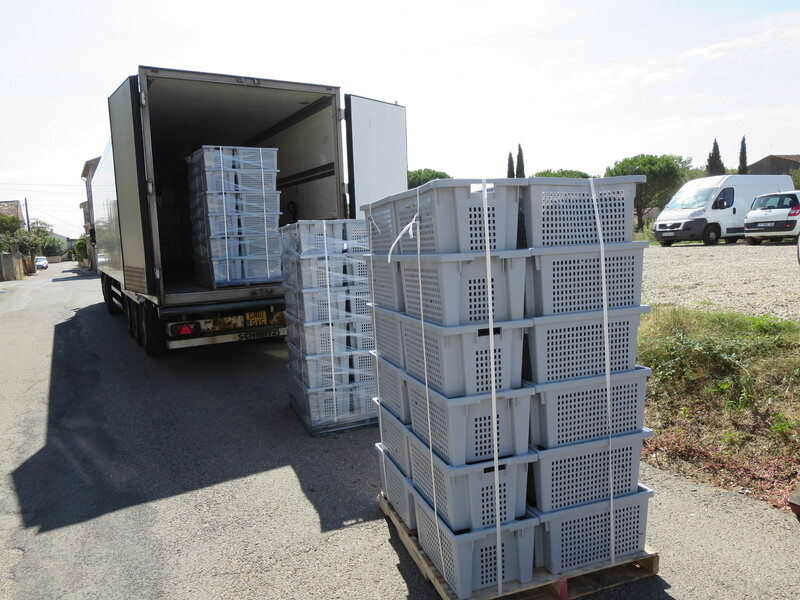 The very dry weather through spring and summer has caused a major drop in production, Jeff reckons most parcels are 30-50% down on quantity even if the quality is very good. That is a big burden to bear and must be a financial blow. 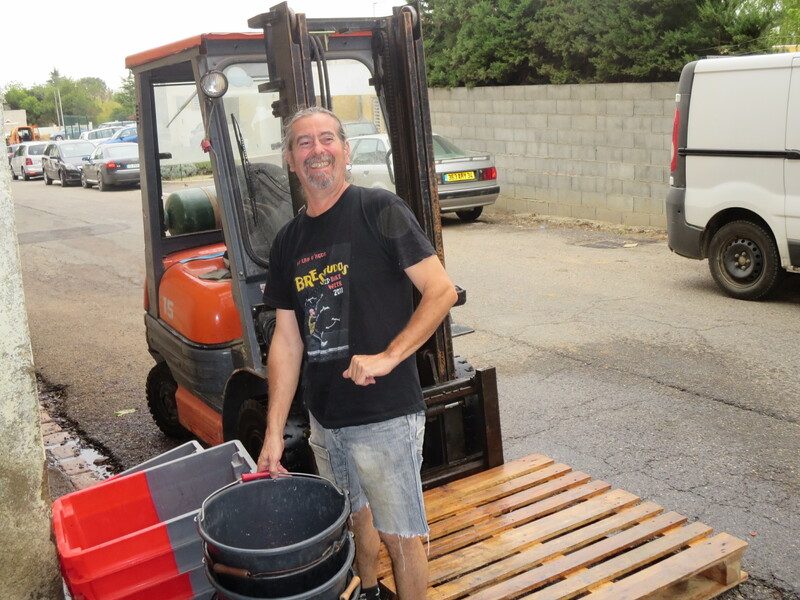 The team which Jeff assembled for the harvest were cheerful, helpful and hard working. Carole has been working periodically with Jeff for 8 years and her experience allied to his leadership meant that work was done according to his wishes but with plenty of smiles and respect. Michel who works for Jeff was also a steady and reassuring presence. 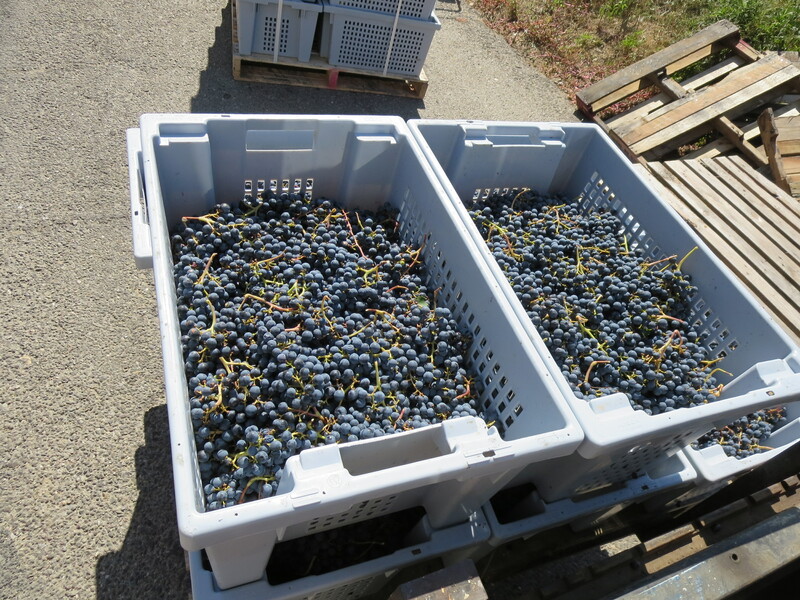 Harvest took place this week in hot, sunny weather. The team in the vineyard picked mainly under the stewardship of Carole and the grapes were ferried back to the cellar within half an hour or so of being picked. 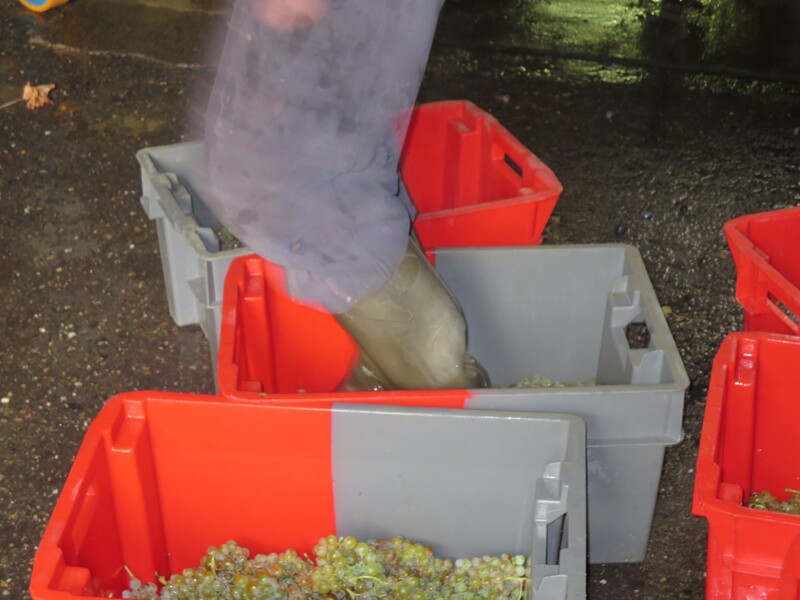 The ‘caisses’ of grapes are then placed on the sorting line. I worked on triage on Wednesday. 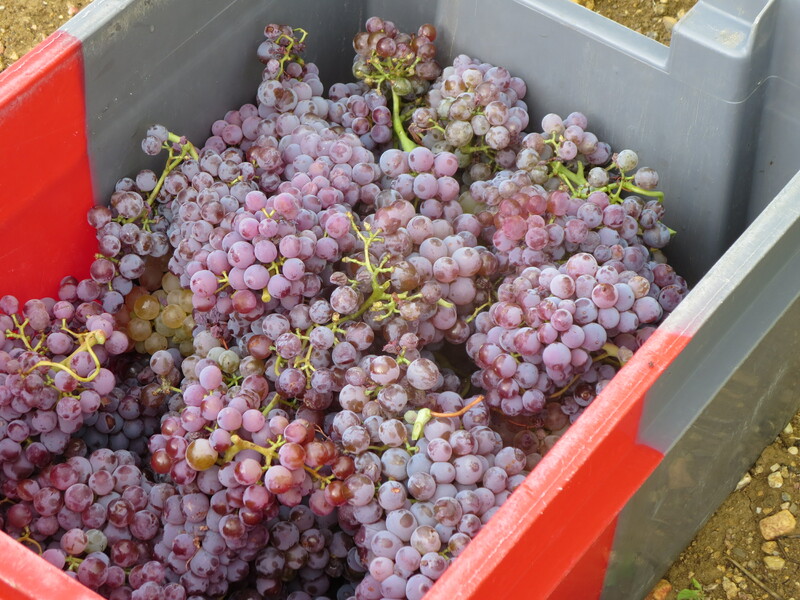 The grapes are taken out of the caisse and inspected for any signs of disease, under ripeness or foreign bodies such as leaves or snails. 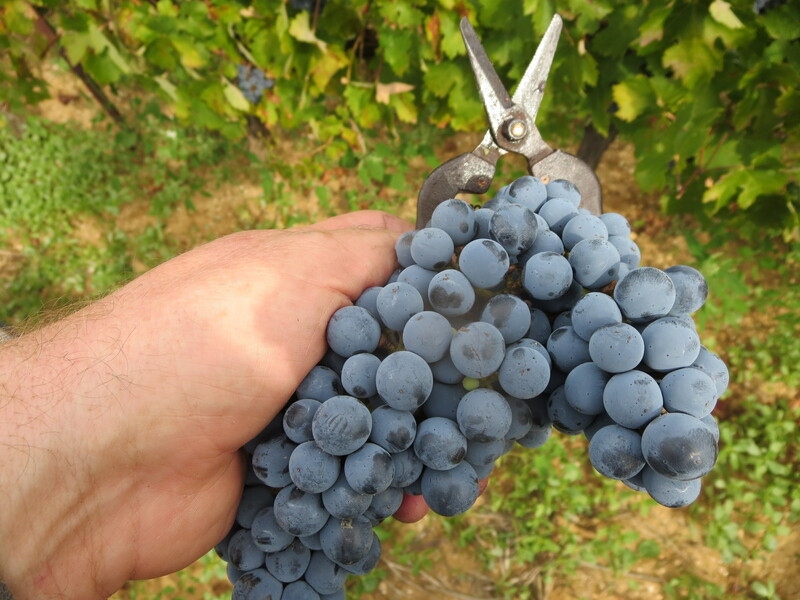 Ripe grapes are placed in the égrappeur which destems the grapes. 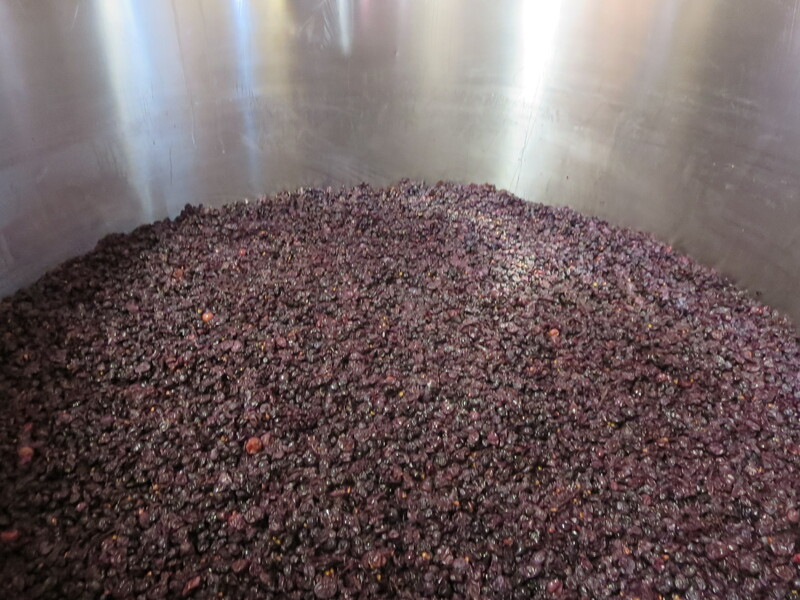 The grapes are then pumped into tank ready to await pressing and to allow the first stages of fermentation. 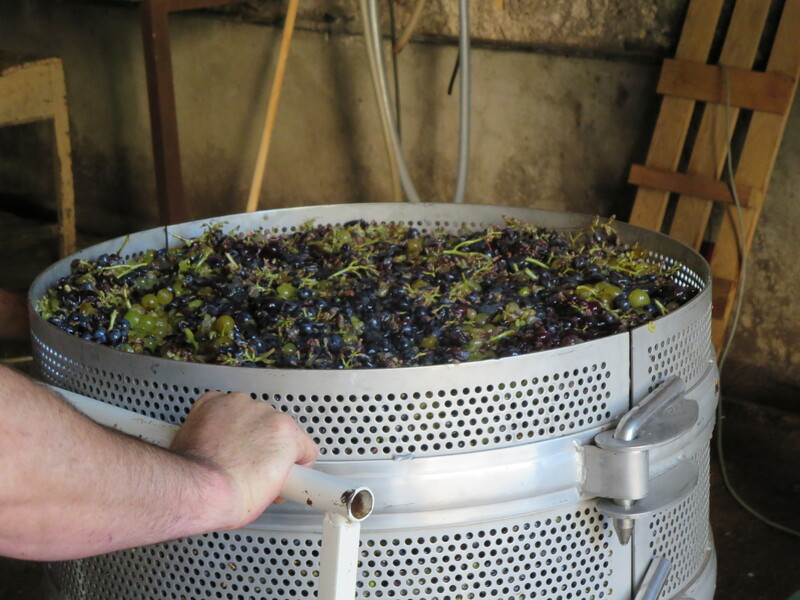 The bunches which were taken out are then checked, and healthy grapes added to the tank. 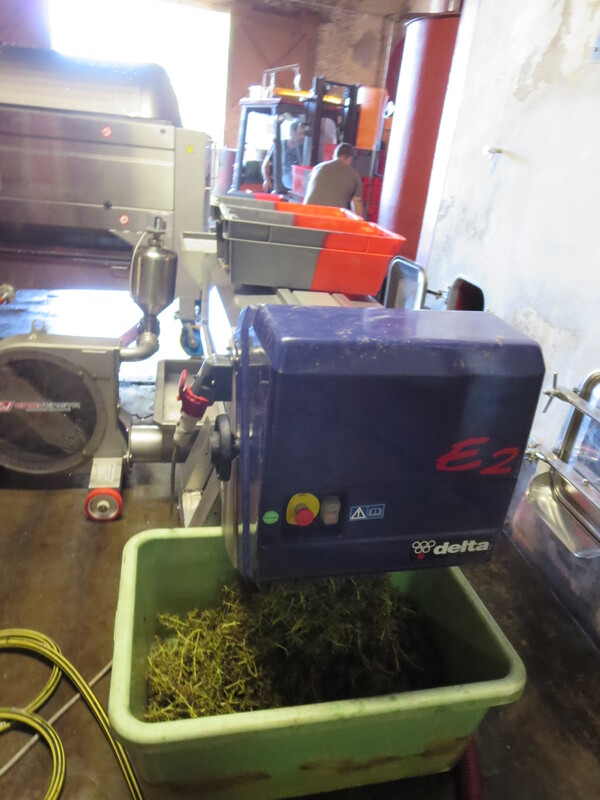 This is slow and careful work, after all Jeff wants only the best quality grapes to go into his wines. 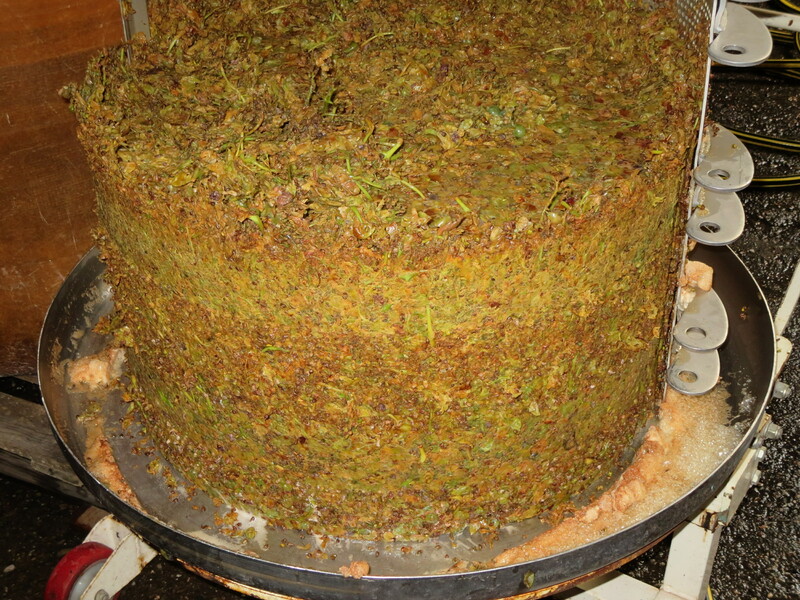 The grapes are given as light a pressing as possible. 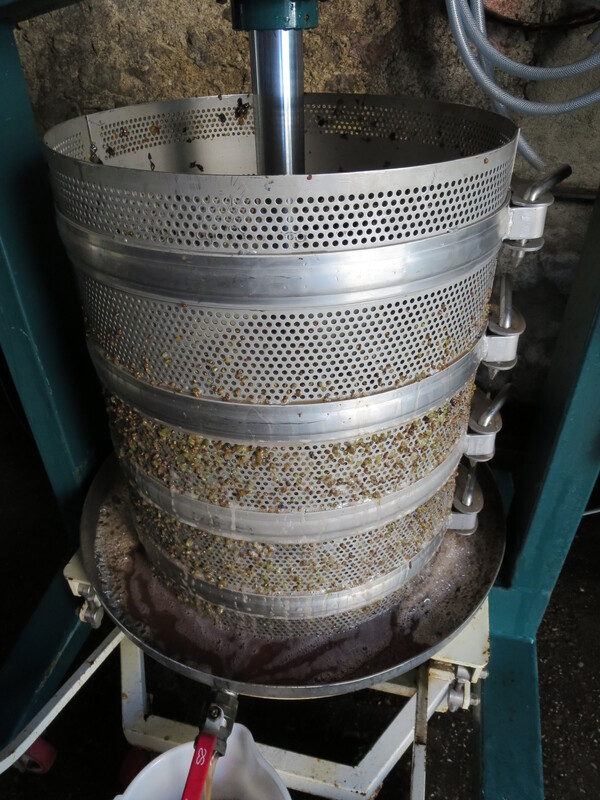 After that initial pumping the wine is allowed to settle and the solids which are left in the wine begin to rise to the top of the tank as they are lighter than the grape juice. This produces a thick layer or ‘cap’ (chapeau in French). 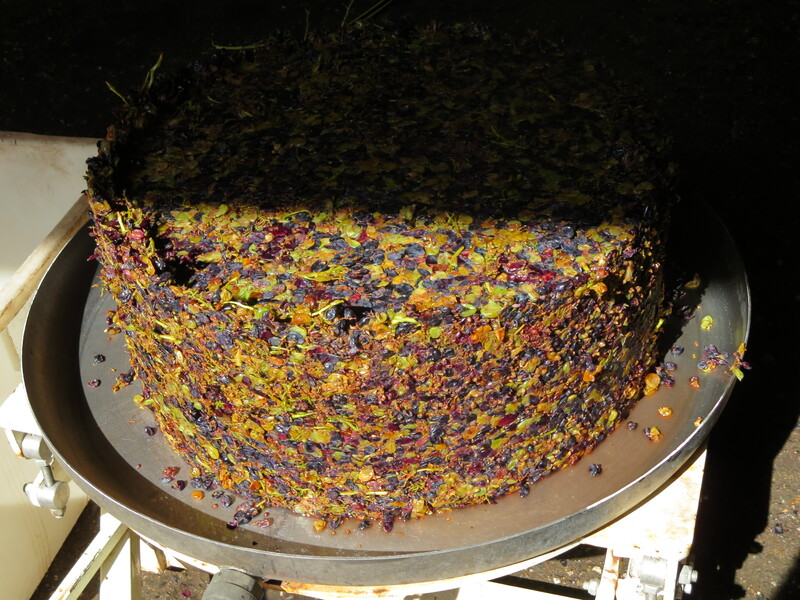 The skins in the cap though contain flavouring and colour for the wine and so it needs to be mixed with the juice. The cap has to be physically pushed down into the juice. 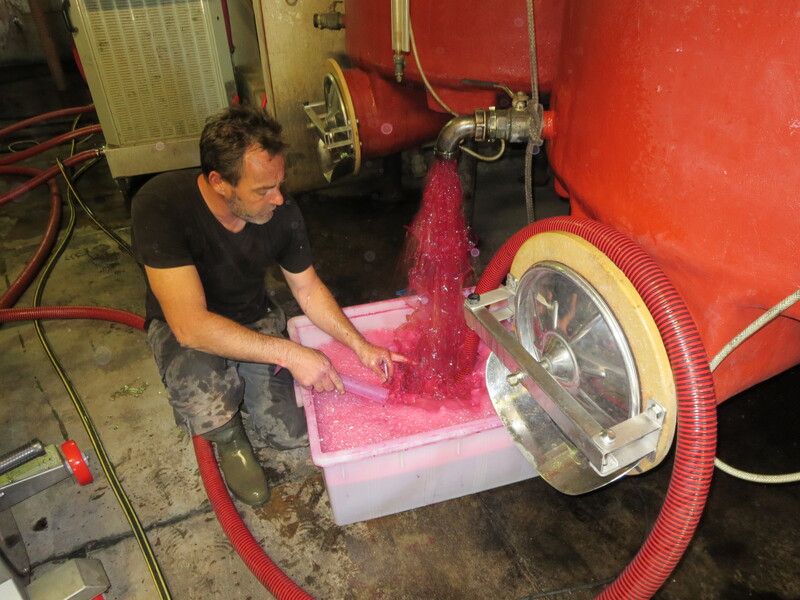 The wines are also ‘pumped over’ (remontage) every day. 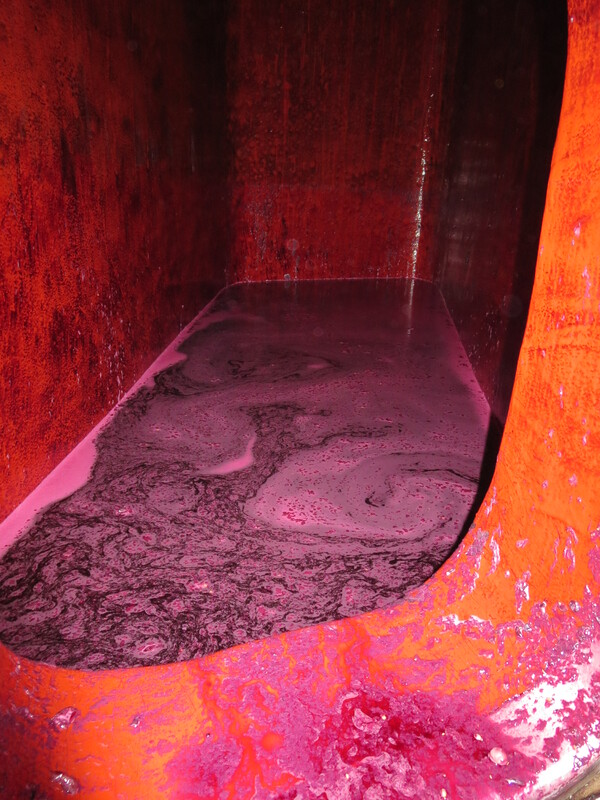 This means the red wine in the bottom of the tank is pumped over the top of the cap to moisten it and to extract the required amount of colour, flavour etc. 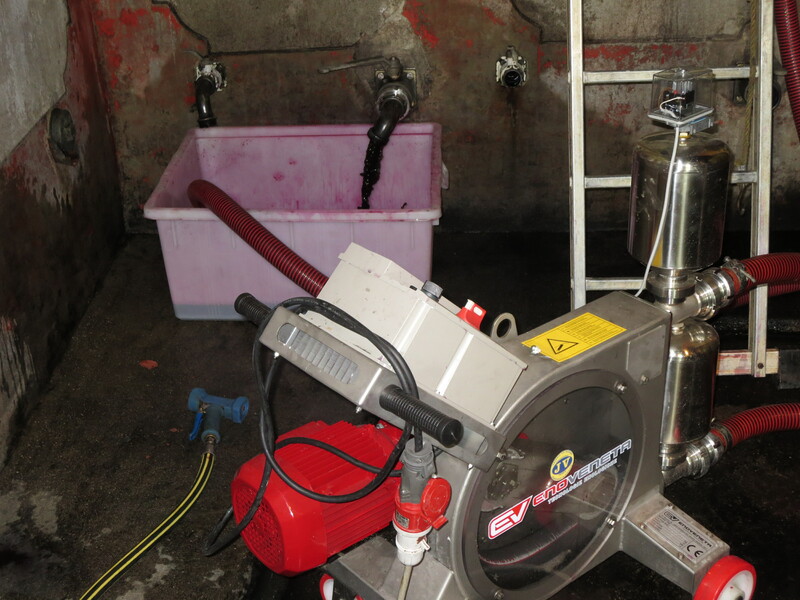 This requires the working of an expensive but vital pump to caress the wine rather than force it. This pump works non stop all day (there are back ups!). 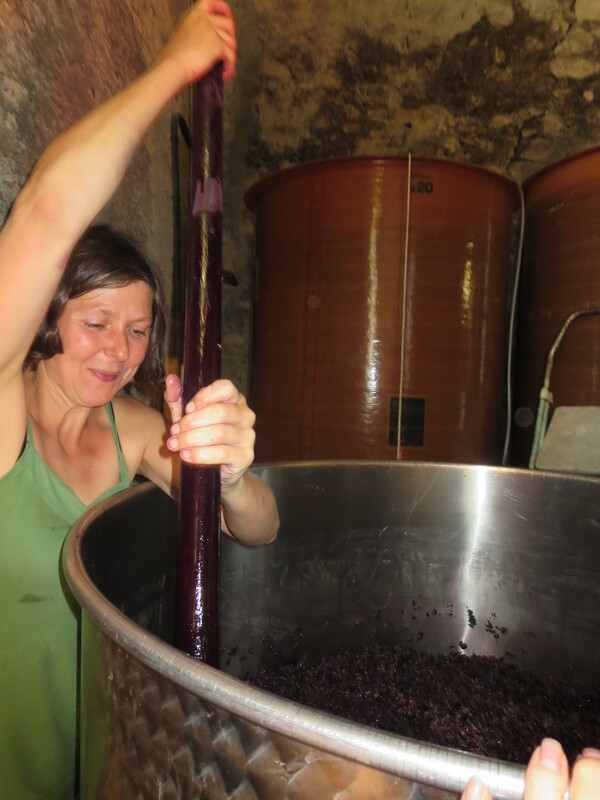 As the harvest progresses more tanks are filled so more and more pumping over takes place. 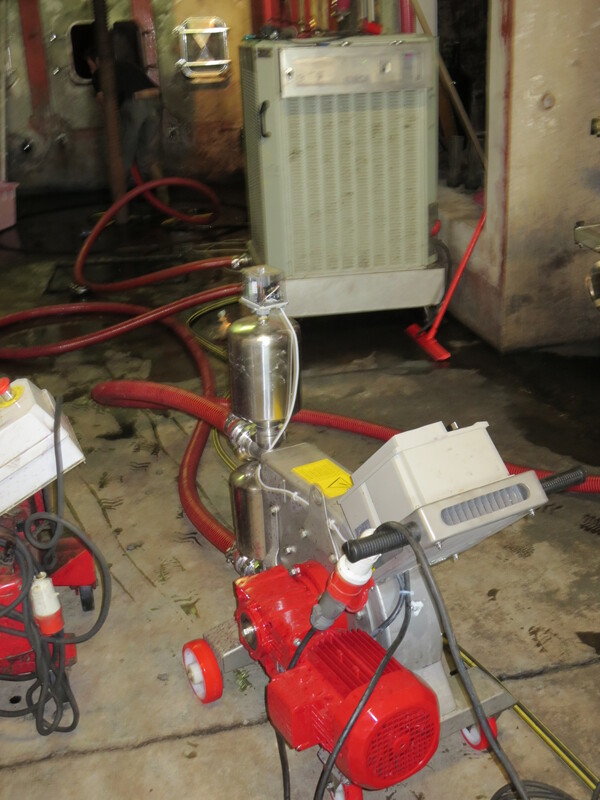 The cellar begins to resemble a plate of spaghetti as hoses run from one tank to another. 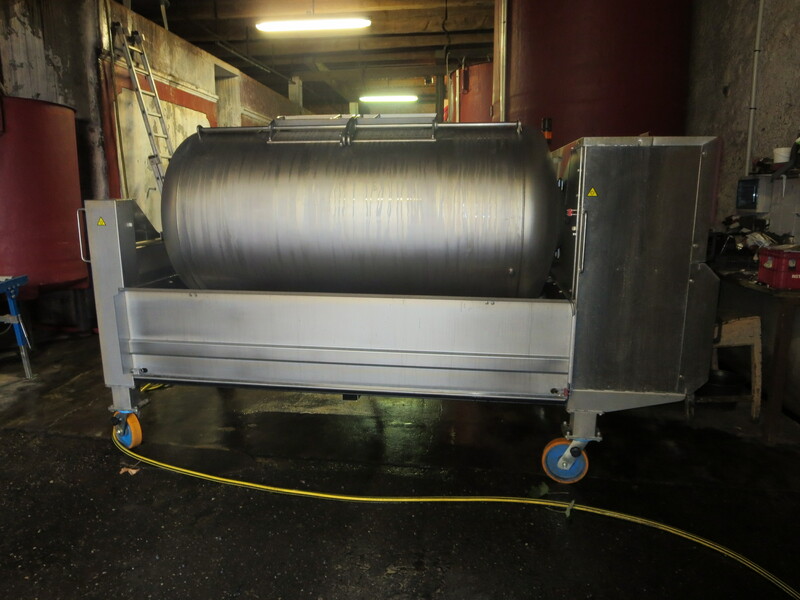 Yet another machine also chills the wine slightly or heats it up if fermentation needs to be encouraged. This machine is in the top right of the photo underneath. How does Jeff keep all these sorted in his head? All the while Jeff tastes the juice which is gently turning into wine and testing its progress using equipment such as a refractometer and other scientific equipment. A real mix of personal judgement and science mixing to best advantage. This continues until Jeff is happy that the wine is right. 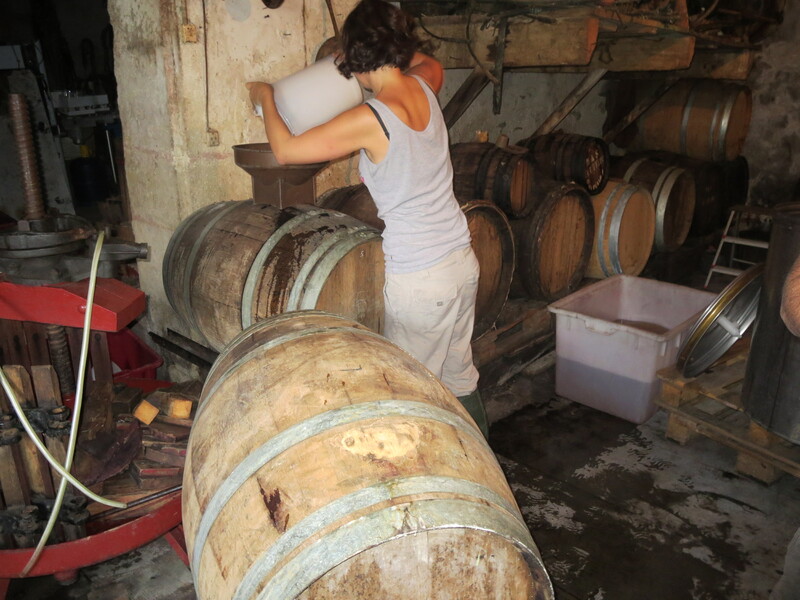 Several weeks of pumping, testing, tasting – an enormous task. There are so many pieces of information for him to keep in his head about the development of each cuve, an amazing effort which leaves him with a definite air of fatigue during the very enjoyable lunches and the post work drink. So what of the Pasteur quotation? 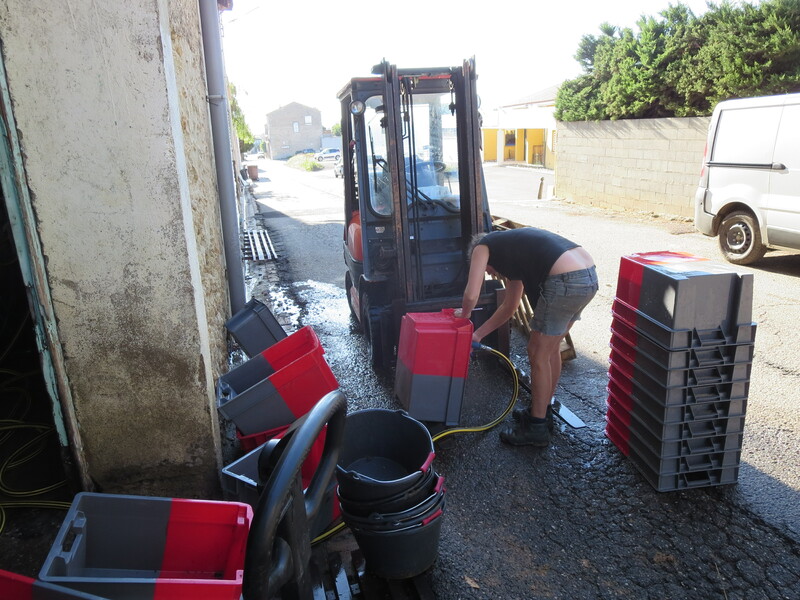 Well as I was working (oh yes I was) two things really struck me apart from the sheer physicality of lugging cases of grapes, hoses, pumps and various items of equipment. Firstly, patience. Jeff waits patiently for the grapes to be just right before picking, he wants the best and is prepared to give nature the time it requires to deliver its best. 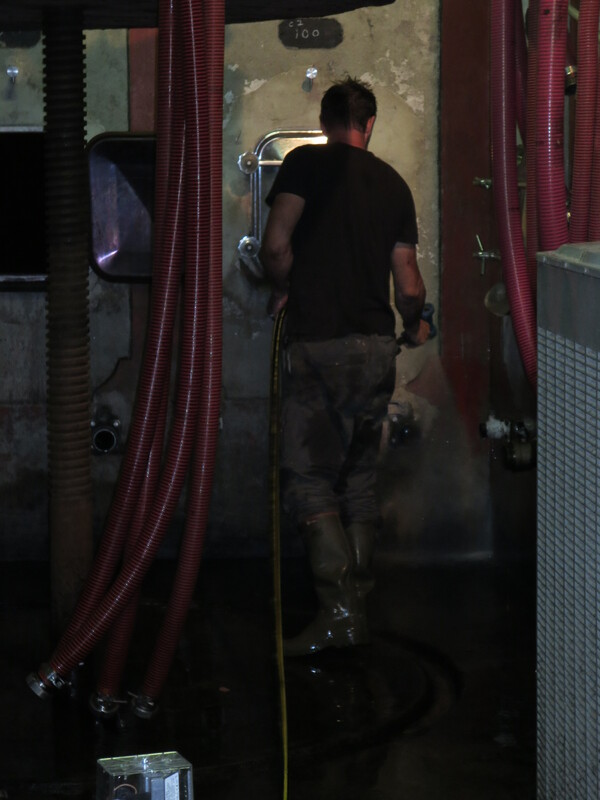 In the cellar he nurtures each cuve and each drop of wine, each stage of the process takes place when the wine dictates to him. 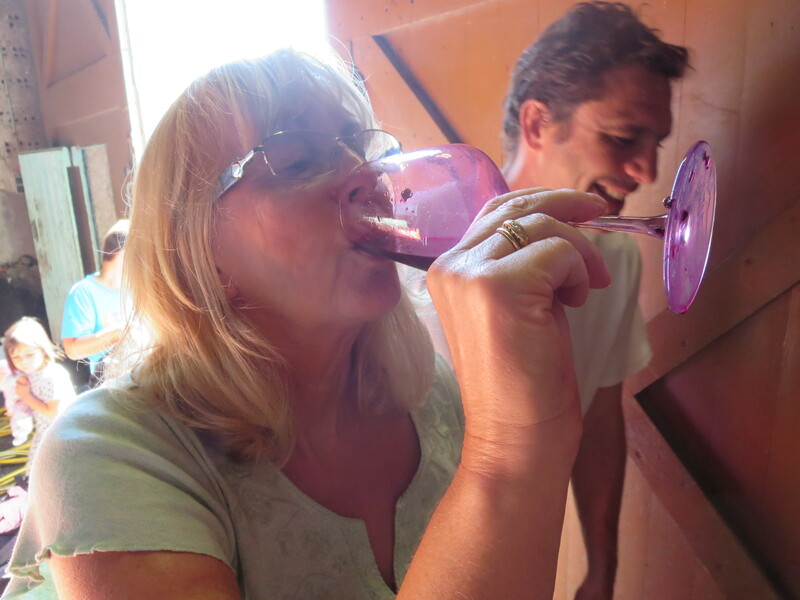 The temptation to rush or to do things because it suits the winemaker is resisted with determination and confidence. 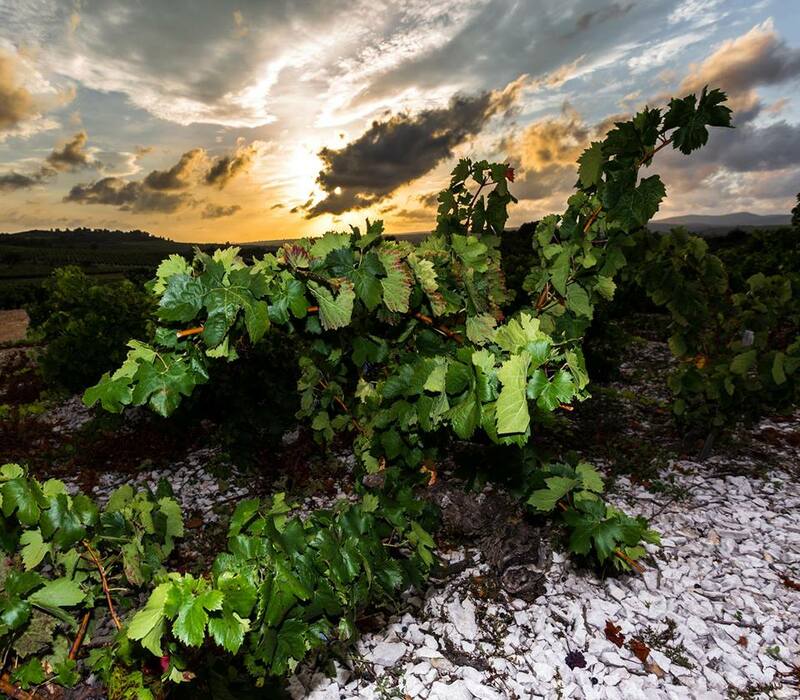 He knows because he produces great wines that if he waits he will produce more great wine. 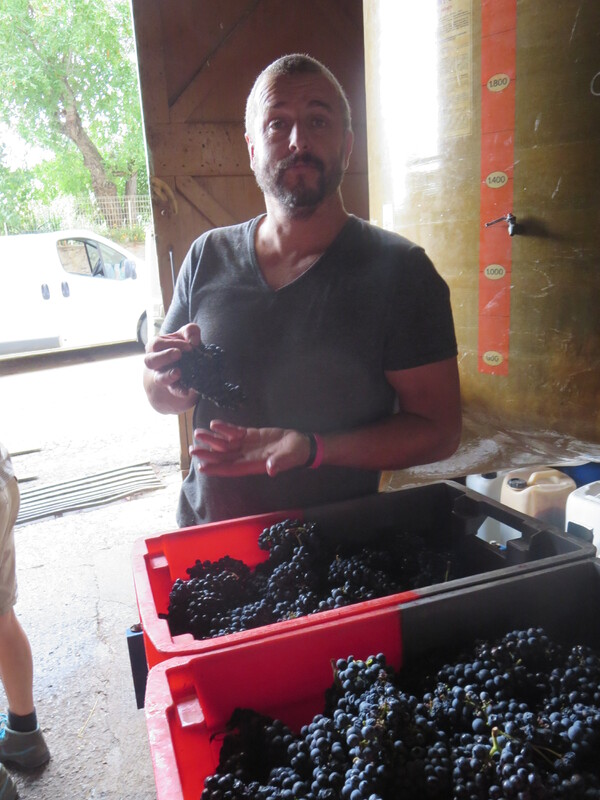 Jeff makes natural wines and for the last couple of years without the use of sulphur to stabilise the wine and help it to fight dangers such as oxidation. To do so everything has to be clean. At every step equipment is washed down and cleaned. Again and again and again. This is drilled into all of us. The risk of harmful bacteria is reduced by hyper vigilance and cleanliness. 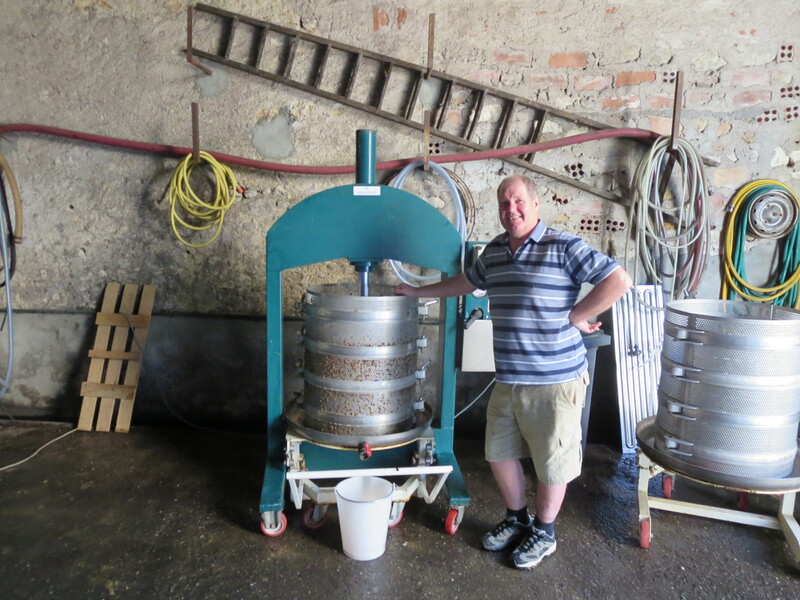 Jeff told me that for each litre of wine produced he estimates that he uses a litre of water for washing and cleaning. I can believe it and in fact it must be much more. Now before I upset other winemakers who clean rigorously and take every care with hygiene I am not claiming that Jeff is unique in this. I was just amazed at how much washing and cleaning takes place. Hence my Pasteur quotation. 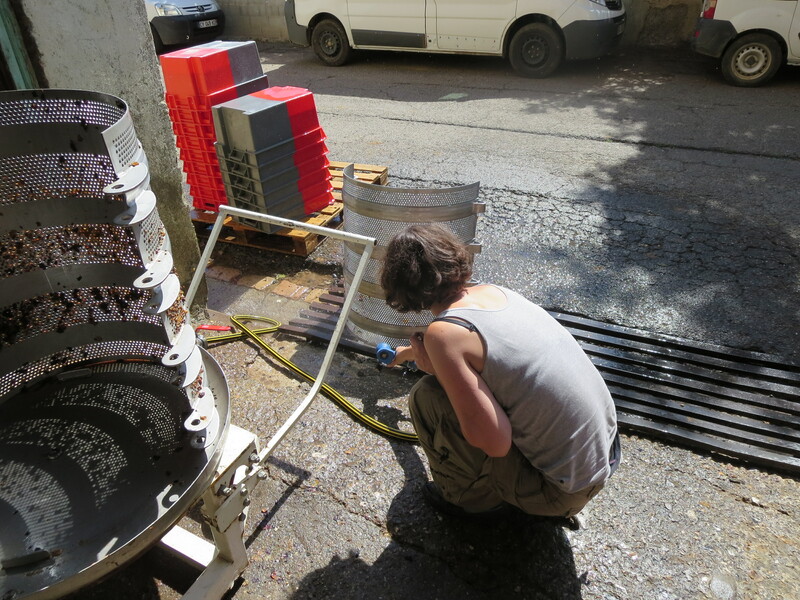 My other job this week was pressing some grapes for some very special wines. More of that in the next post. 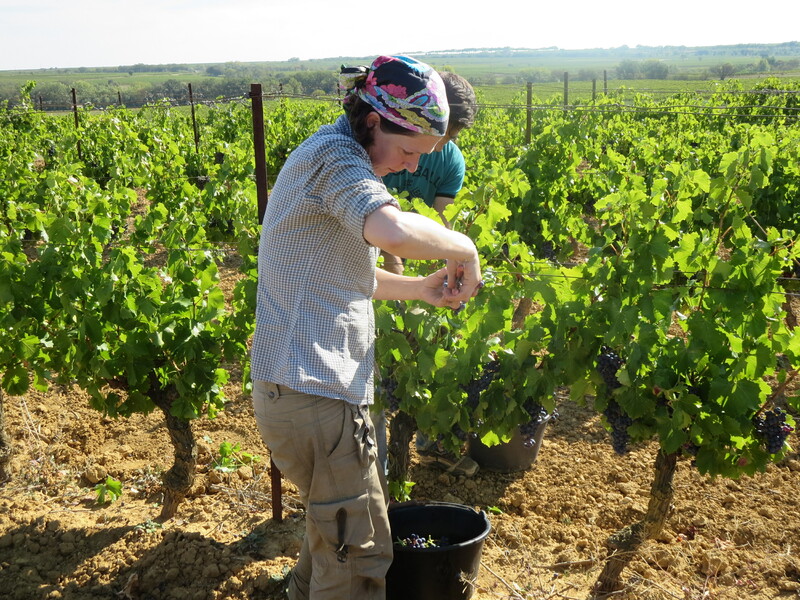 Categories: Vignerons, Vines, Wines | Tags: cleanliness, Jeff Coutelou, Pasteur, picking, pressing, pump, remontage, sorting, sulphur, triage | Permalink.